ADAM AND EVE - FACT OR FICTION? A sudden global flood sends seas and rivers ripping over their banks. Torrents of rain cascade down. And an untested wooden ship is supposed to withstand the screaming winds and waves - for an entire year? Absurd. . . or is it? How could Noah build such a huge ship? Did ancients have the technology? And how could the ark hold all the animals? Startling new oceanographic tests point to inescapable conclusions. Persia....China.....Egypt.....In more than 200 cultures around the globe, the same story surfaces. Ingredients include a flood, a large boat, animals, and a few select survivors. Coincidence? Or the ancient thread of a shared historical experience? But where could enough water be found to cover the earth? And where would it all go? 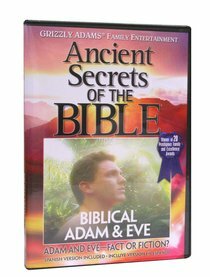 Consider the shocking secrets unlocked by recent scientific findings and archaeological digs! Can it be true? Does a giant wooden ark lie beneath ice on the crumbling north slope of Mount Ararat? An ark that has been seen, and reported, by dozens of reliable witnesses? And what about the alleged missing photos of the ark? Truth or fiction? Decide for yourself, but not before you share the remarkable adventures of Ararat's explorers documented in this video. Two cities scorched into oblivion as fire and brimstone pour down from the sky....and only one man and his family escape the disaster. "Impossible," say critics. But recent archaeological digs say otherwise. See for yourself: Do ancient bones, pottery, and ashes sifted from stony ground south of the Dead Sea have a story to tell the world today? A burning bush appears on a rocky hillside. A sign from God....or the hallucination of a sunstruck shepherd? Nearly two million refugees scramble across the Red Sea on a mysterious ridge of dry land, then watch a pursuing Egyptian army drown....a miracle or mirage? Discover the amazing truth!